The P-40 fighter/bomber was the last of the famous "Hawk" line produced by Curtiss Aircraft in the 1930s and 1940s, and it shared certain design elements with its predecessors, the Hawk and Sparrowhawk. It was the third-most numerous US fighter of World War II. 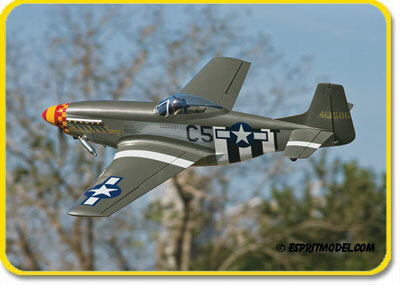 Superior speed, range, armament and maneuverability enabled the P-51D Mustang to rule the skies during World War II. Now you can put yourself in the cockpit of this famous fighter. This model combines legendary Gold Edition quality with the ease of ARF construction. 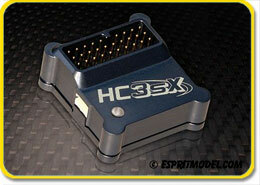 Precise interlocking design with plenty of preassembly ensures a short box-to-flight time of only 18-25 hours. The Republic P-47 Thunderbolt, also known as the "Jug" was the biggest, heaviest and most expensive single-engine fighter in history to be powered by a piston engine. 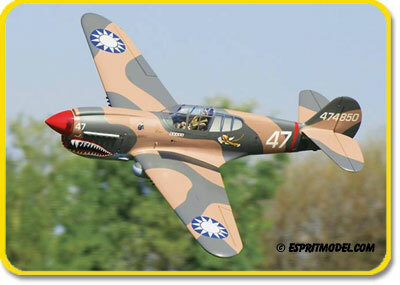 It was one of the main United States Army Air Forces (USAAF) fighters of World War II. No German piston-engine plane could out-dive the Thunderbolt. 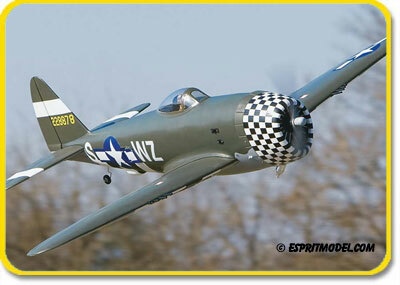 The P-47 was the fastest-diving American aircraft of the war, it could reach speeds of 550 mph (885 km/h). Gentle, smooth, and very long flights are the standards for this beauty. The careful use of composites with competition balsa, creates a good light structure that will hold its shape for a long time. The synergy of low weight and strong structure is very unusual in a production sailplane and can only be achieved with careful attention to design and construction. The entire model is constructed using free-flight techniques. The wings as well as stabilizer are all balsa built-up with Carbon Fiber main spare. The fuselage is gel-coated fiberglass with white finish. Whole model is covered with Ultracote. All control surfaces are hinged with adhesive tape. This fully built sailplane needs only basic assembly and motor/radio installation. The 3-piece wing and horizontal stabilizer are each easily removable for transport and storage. Each part is carefully hand-crafted with meticulous attention to detail. Great starter electric sailplane with easy building and smooth flights. New, Upcoming for 2011 Season!!!!! 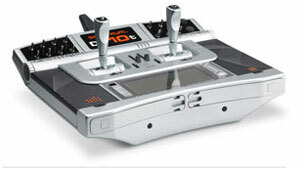 The Spektrum DX10t is an extremely light-weight, universal-application, high-end tray radio. 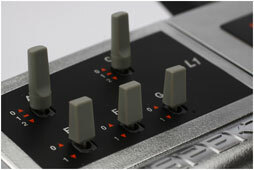 The DX10t is a modular design, so customizing its switch layout for the proper application means no matter what kind of modeler there is, the 10t has everyone covered. It features the next evolution of Spektrum's AirWare software, which has been thoroughly refined and expanded, offering modelers a level of functionally and customization never before available. The DX10t supports up to 10 flight modes in Sailplane mode and 5 flight modes in ACRO and Heli, allowing for an unprecedented amount of user personalization, ideal for competition modelers. The switch modules are interchangeable, and assignable, allowing for customized switch positions depending on user application. The radio will allow for real time telemetry feedback, an SD card reader built in, meaning model transfer and the ability to upgrade the radios software over time. 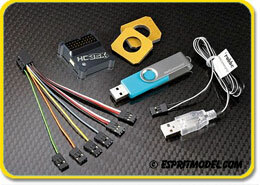 The SD card will also allow for data writing, so information gathered during use will be stored on the card, allowing for an in-depth look at model performance. 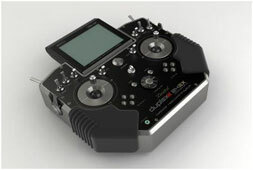 The DX10t includes the high-speed AR10000 10-channel receiver and a 2500mAh LiPo battery for extended field use. 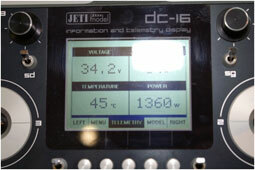 Jeti showed us their revolutionary DC-16 transmitter. Available sometime around mid-2011 the radio's casing sports a CNC-machined magnesium frame and alloy upper and lower parts for that overall spacey look. The sticks feature hall sensors rather than standard potentiometers for more precision and consistent performance over the whole lifetime of the transmitter. Offering 16-channels and 2.4GHz Duplex telemetry technology the DC-16 is updatable via PC interface, has a five language menu, 2GB of internal memory and weights only 1.2kg. 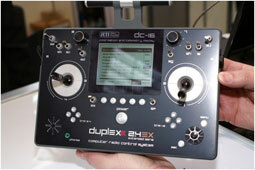 The Duplex telemetry system shows all data in realtime in the radio's display and also offers voice warnings. 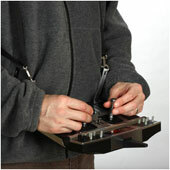 Later on a DS-16 called hand held transmitter is planned for those who don't like to operate the sticks with their thumbs. 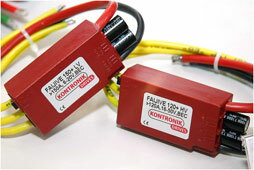 Kontronik extended the Jive series of electronic speed controllers. The Heli Jive has special helicopter features beside the currently known two heli modes like a special mode with variable and fixed RPM control and an autorotation mode that allows for a quick motor spool up after performing autorotation. 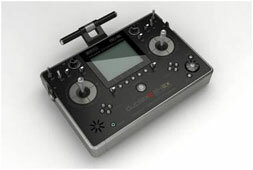 The Heli Jive is adjustable only via Kontronik's Progdisc programming device. 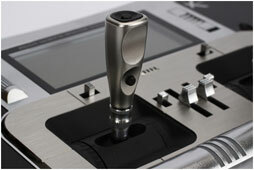 Also available are four new airplane Jive controllers in the form of two FIA Jive and two F3A Jive offerings. All four address the competition pilot with the LV version is made for 4S to 5S LiPo packs while the HV is usable with 6S battery packs. 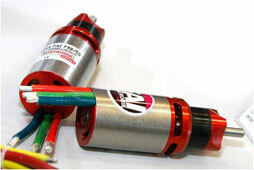 The FIA types come with adjustable delayed brake to safe the gears and gear boxes and also feature special protection systems to go with the used low-inductive competition motors. The F3A versions address the aerobatic pilot, feature real proportional brakes and constant RPM mode for even more precise aerobatic flying. 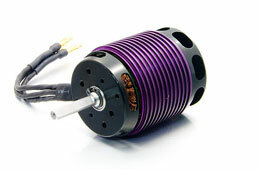 Hacker also cares for the helicopter pilot with their new Turnado A50-12L 470kv outrunner brushless motor. 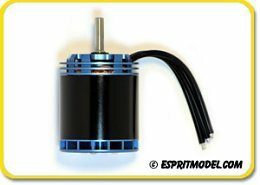 Made for the use with 10S to 12S LiPo packs a new stator winding allows for better cooling, higher efficiency and increased torque. 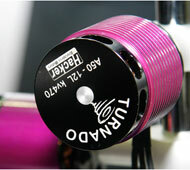 The Turnado should be available very soon to fit your choice of 700-class helicopters. 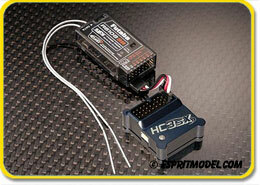 Hacker showed the new Senstrol 120 brushless airplane motor and controller combo. Coming with what they call Constant Power Management the controller simply holds the RPM adjusted by the transmitter stick irregardless the flight situation the plane. 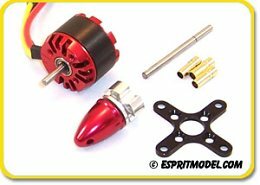 For example the plane is flight into a loop then the controller holds the RPM by putting more power on the motor and also holds the RPM when going downwards again by given less power on the motor. F3A pilots who need this constant speed flight situation will welcome this. 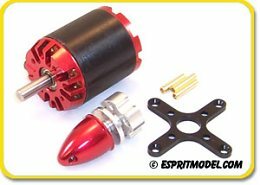 Also, when turning the motor off the prop is positionable in any position you want and it stays there until you start the motor again. Hacker achieved this by having a 4096 step encoding system for the motor and fully automatic real-time variable frequency and phase sequencing calculation. 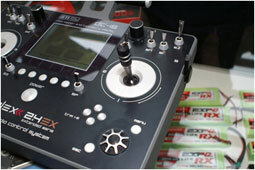 The system is fully RPM controlled giving proportional RPM output with stick movement. 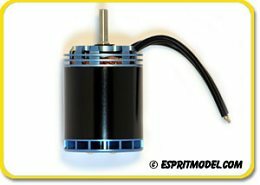 The system is made around Hacker's C50 line of brushless motors with KV rating variants available when the Senstrol system is finally available. 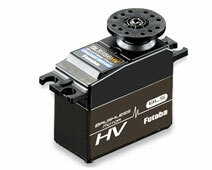 Futaba Japan released first information on a new 7.4V high voltage line of servos. 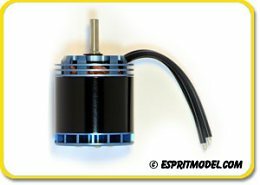 Available as both brushless "BLS" motor and conventional "S" motor servos the items are usable with an input voltage of 6.0V and 7.4V. 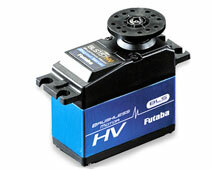 The BLS156HV, BLS157HV and S3051HV servos also become available as bundles of 4 servos including a Futaba 2.4GHz 8-channel R6208SB S-Bus receiver. 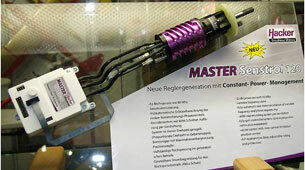 Hitec's new Power Miser brushless servos are 6.0V to 8.4V high-voltage items with Neu/Castle brushless motors and a newly designed digital circuitry that is customisable via Hitec's own PC software. 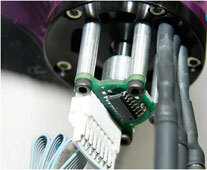 The servo's feature Titanium gears and with metal-plastic-duralinium 1st gears. 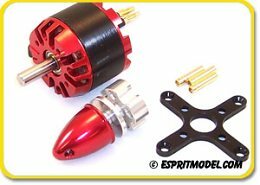 The hybrid gear promises maximum durability and creates a certain "anti-glitch" effect as it prevents the electrical contact between the servos and the aircraft's or helicopter's hardware. 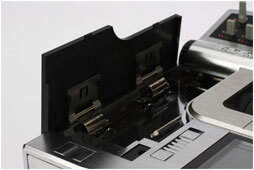 Available will be the HSB-9360TH (0.07s/16.5kg), the HSB-9370TH (0.10s/23.0kg) and the HSB-9380TH (0.14s/35.0kg - all @ 7.4V). 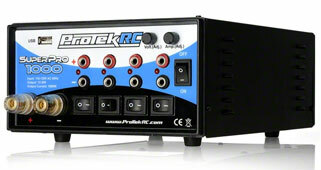 The Super Pro 1000 is a regulated DC power supply with USB charging port and a total of five power outputs. 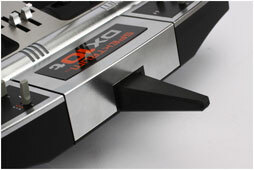 This is the same as their powerful Super Pro 40 power supply but with twice the power and increased flexibility. Not only does it feature the same four individually switched 16 amp outputs and single 40 amp output, but also an LED display on the top, independent variable voltage and current output controls on the front and 1000 watts of power. 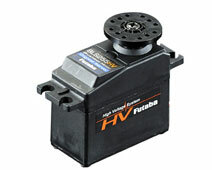 This will allow you to easily operate your 12V to 30V equipment from one power supply with power to spare. Using switch mode technology, it provides a higher level of efficiency and reduces the overall weight and size of the power supply compared to other systems with similar features. 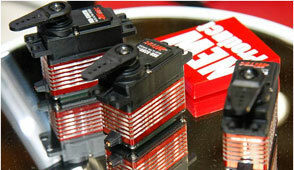 In addition, the smooth output current is ideal for any item that requires a 40 amp, 12-30V power source. It also includes a built-in 500mA USB charging port, which will allow you to charge any USB device conveniently at your work space.